Have you worked at cleaning old from bathroom ceiling spots only to have them surprise you by coming back? To really get rid of mold, you have to not only clean it away, you must also kill it. In problematic cases, it may even require replacing ceiling tiles or sheet rock. If the mold on your bathroom ceiling covers ten square feet or less, it is considered a small area and you can take care of cleaning it on your own by following the correct procedures. Mold that covers more of your ceiling than this may require professional services. Wash the area with a cleaning solution of mild detergent and warm water. Let the affected area dry. Mix one-quarter cup of bleach with one quart of water and apply the solution. Wait for 20 minutes and apply a second time. Allow another 20 minutes to dry. It is important to realize that the fact that your ceiling looks clean after you clean it doesn't mean that lingering mold spores won't survive. You will need to treat the ceiling after you have cleaned it and take steps to correct the problems in your bathroom that contributed to mold growth in the first place. After you clean the ceiling, you'll also want to treat it to kill any remaining spores and reduce the likelihood that a mold problem will develop again. Mix a solution of borate-based detergent (such as Borax) and apply it. This solution should not be rinsed, but left to stop mold from growing in the future. Borates have stain removal properties and control bacteria and fungi. Fix water leaks. If pipes run through your ceiling be sure to check for and repair any plumbing leaks. Pipes may need to be wrapped to prevent condensation. Increase ventilation. Open doors and windows to increase air flow. If you don't have a window in your bathroom, install an exhaust fan. Clean your bathroom regularly to eliminate any mold spores. If you suspect mold as the cause of your health problems, talk with your doctor and call in a professional to investigate. 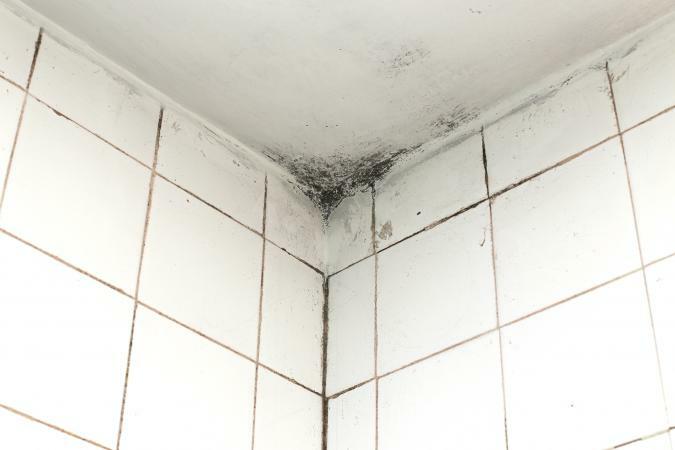 If the mold in your bathroom isn't that serious, follow the steps above to clean up the problem and keep it under control.